Flying Start and The Anna Freud Centre have been working collaboratively on a project over the past 18 months to offer a group for parents and babies with a focus on improving attachment. The Think Baby group is offered across all four of the Flying Start neighbourhoods and is a perfect group for you to refer into if you have concerns about the early attachment behaviour displayed by a parent and their baby. Research shows that from conception to the age of two, a baby’s brain is developing fastest, meaning their earliest experiences shape their brain and can have a lifelong impact. Within this crucial period of development, a baby is most susceptible to forming strong bonds (known as attachment) with his or her parent or primary caregiver, and there is longstanding evidence that a baby’s social and emotional development is affected by their attachment to their parents. Infants and parents can be at risk of negative impacts on their development and emotional wellbeing due to, for example, trauma (e.g. domestic violence), mental health issues (e.g. postnatal depression), economic hardship, and other challenging situations (e.g. being a member of a minority or migrant group). Other conditions, such as living in an area of high deprivation, can also place strain on the parent-infant relationship. In Luton there is a high level of socioeconomic disadvantage and the prevalence of mental health needs in under-5s is rising. The Luton Parent Infant Project is an extension of a successful pilot to improve the life chances of disadvantaged children. Parent Infant Psychotherapy (PIP) is an approach to strengthen the parent-infant relationship, which has a unique reputation for making a real difference to the lives of high-risk parents and babies. We have scaled up and extended the Anna Freud PIP model across Children’s Centres in Luton, following a successful pilot of the programme with Luton’s central neighbourhood in 2014/15. 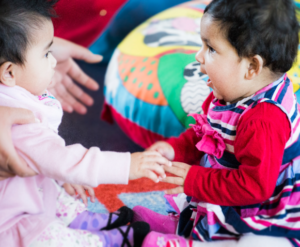 The project has involved training the Flying Start Children’s Centre workforce to improve their understanding of babies’ social and emotional developmental needs and the importance of the parent-infant relationship. In this way, they are better able to support parents and children within the non-stigmatising environment of drop-in baby groups. Improved relationships at this stage in a baby’s life can have a positive impact on mental health well into adulthood. This, in turn, improves educational, employment and social prospects for children as they grow. Additional in-depth training was provided by the Anna Freud Centre, and supported by CAMH, to develop facilitators skills to lead the Think Baby groups and provide reflective and calm environments where the focus is on the parent and child interaction. The project is currently being evaluated by the Anna Freud Centre and an end of project report will be available in the Spring 2019. The project was kindly funded by the Sylvia Adams Charitable Trust in partnership with Flying Start. Referrals can be made using the Children’s Centre service request form https://www.flyingstartluton.com/childrenscentres/ and centres will contact parents to invite them to the session. As the referrer, please ensure you have consent from the parent for this contact to be made. Parents can also self-refer.